Background: Definition of the optimal left ventricular (LV) lead position in cardiac resynchronisation therapy (CRT) is desirable. Objective: To define the optimal LV lead position in CRT and assess the effectiveness of CRT depending on the LV lead position using new myocardial deformation imaging. Methods: Myocardial deformation imaging based on tracking of acoustic tissue pixels in two-dimensional echocardiographic images (EchoPAC, GE ultrasound) was performed in 47 patients with heart failure at baseline and during CRT. In a 36-segment LV model the segment with the latest peak systolic circumferential strain before CRT was determined. The segment with maximal temporal difference in peak systolic circumferential strain on CRT compared with before CRT was assumed to be the LV lead position. The optimal LV lead position was defined as concurrence or immediate neighbouring of the segment with the latest contraction before CRT and those with assumed LV lead location. Results: 25 patients had optimal and 22 non-optimal LV lead positions. Before CRT, the LV ejection fraction (EF) and peak oxygen consumption (Vo2max) were similar in patients with optimal and non-optimal LV lead positions (mean (SD) EF = 31.4 (6.1)% vs 30.3 (6.5)% and Vo2max = 14.2 (1.8) vs 14.0 (2.1) ml/min/kg, respectively). At 3 months on CRT, EF increased by 9 (2)% vs 5 (3)% and Vo2max by 2.0 (0.8) vs 1.1 (0.5) ml/min/kg in the optimal vs non-optimal LV lead position groups, respectively (both p<0.001). Conclusions: Concordance of the LV lead site and location of the latest systolic contraction before CRT results in greater improvement in EF and cardiopulmonary workload than the non-optimal LV lead position. Cardiac resynchronisation therapy (CRT) has been proved to be indisputably beneficial for patients with symptomatic chronic heart failure (HF) associated with prolonged QRS complexes.1–6 Improvements in clinical symptoms, exercise capacity and left ventricular (LV) function, resulting in reverse LV remodelling and improved cardiac efficacy can be accredited to CRT. However, for up to one-third of patients CRT is inadequate. The success of CRT depends on individual patient characteristics (in particular, the severity of mechanical dyssynchrony) and technical measures (possibility of reaching synchronous LV contraction with CRT). Several studies have tried to identify predictors of a positive response to CRT.7–9 Recent studies have suggested a significant role for echocardiography in the assessment of systolic dyssynchrony and for prediction of functional improvement.8 9 These studies have concentrated on the identification of patients with significant mechanical dyssynchrony. However, the success of CRT is not only dependent on the existence of dyssynchrony but is also likely to be dependent on procedural factors such as programming of the CRT system and adequate LV lead placement. A clinical study indicated that the best possible resynchronisation effect is associated with an LV lead placement in the area of greatest delay in electrical activation and mechanical contraction.10 Still, the identification of the optimal LV lead position has attracted little attention so far. This relates to difficulties in defining the LV segment with the greatest mechanical delay as well as defining the LV lead position and their spatial concordance. This study sought to (a) identify the LV segment with the latest mechanical contraction (defined by its deformation properties) before CRT; (b) identify the LV lead position using the new myocardial deformation imaging method; and (c) determine CRT effectiveness in relation to the concordance of the LV lead position and LV segment with the latest mechanical contraction before CRT. Forty-seven consecutive patients with HF and successful CRT implantation (mean (SD) age 58 (9) years, 31 men) were included in the study. None of the patients died during the 3-month follow-up. All patients participated in a baseline and 3-month follow-up examination. Criteria for CRT implantation included New York Heart Association (NYHA) functional class III (n = 34) or IV (n = 13) despite optimal pharmacological treatment, evidence of LV systolic dysfunction with ejection fraction (EF) <35%, and a QRS >120 ms, either in the form of bundle branch block or intraventricular conduction delay. Thirty-four patients had had a myocardial infarction within the past year (17 anterior, 3 lateral, 8 inferior, 6 posterior) and in 13 patients the cause of HF was non-ischaemic. Adequate clinical response to CRT was defined as (a) no interim admission to hospital for decompensated HF at follow-up; (b) a decrease in NYHA functional class of one point or more or, if NYHA was unchanged, a >10% increase in peak oxygen consumption, Vo2max, at follow-up compared with baseline. This study was approved by the local ethical committee and all subjects gave written informed consent. The right ventricular pacing lead was implanted at the apex. The LV pacing lead was inserted by a transvenous approach through the coronary sinus into a cardiac vein of the free wall. An average of 2.2 veins (the same for the group with optimal and non-optimal LV lead placement) was evaluated intraoperatively to reach an optimal LV lead position. This required intraoperative absence of diaphragmal pacing, adequate pacing measures (sensing and pacing threshold) as well as reduced width of the QRS complex and improved haemodynamic variables (reproducible increase in systolic and mean blood pressure from sinus rhythm to biventricular pacing). All patients received a biventricular cardioverter-defibrillator (Attain-System with InSync Marquis, Medtronic, n = 33 or Aesula-System with Epic HF V-339, St Jude Medical, n = 14). The physician performing LV lead placement and the physician performing the echocardiographic examination were blinded to each other to exclude bias in defining the lead position. To determine the optimal atrioventricular (AV) time we used Doppler echocardiography. We started with a long AV period and shortened this time step by step until we reached a maximal mitral inflow profile (maximal time velocity integral) without shortening the A-wave duration. Forty-four patients had an optimal AV time between 100 and 150 ms (mean (SD) time 127 (15) ms). In one patient it was necessary to programme a shorter AV time (70 ms). The VV timing was set to zero in all patients included in this study. Patients underwent symptom-limited bicycle cardiopulmonary exercise testing (10 W/min increments) at baseline and after 3 months of CRT. VO2max at peak exercise was defined as the highest oxygen consumption measured during the last 30 seconds of the symptom-limited exercise test and expressed as ml/kg/min. Myocardial deformation imaging for analysis of cardiac dyssynchrony was performed on the basis of six parasternal short-axis views acquired with two-dimensional tissue harmonic imaging (mitral valve level, papillary muscle level, apical level and for each of these views an additional short-axis view further to the apex at a distance midway between two main levels was acquired). The frame rate for these studies was between 56 and 92 frames/s. Analysis of the parasternal short-axis two-dimensional echocardiographic images was performed offline with the aid of a dedicated software package (EchoPAC, General Electrics, Horton, Norway). This system tracks acoustic markers within the myocardium frame to frame during several consecutive cardiac cycles for calculation of circumferential strain.11 12 A tracking setting was selected which included as much myocardium as possible but prevented inclusion of tissue outside the myocardium. The software comprises an automatic grading of each segment measuring the tracking quality on a scale ranging from 1.0 for optimal to 3.0 for unacceptable. Segments with suboptimal tracking quality (grading >2.0) were systematically dismissed from the analysis. Visual control of tracking quality was performed to ensure accurate automatic tracking. Echocardiographic image quality was found to be adequate to allow strain analysis in 86% of all 1692 collected segments. For each LV segment with adequate tracking quality circumferential strain was automatically calculated as a mean over the whole segment. Circumferential strain relates to circumferential deformation along the curvature of the left ventricle in the parasternal short axis. For each segment time to peak systolic strain was determined considering the maximal negative strain after the QRS complex. To define the severity of LV dyssynchrony, the temporal difference between the segment with the earliest and latest peak systolic circumferential strain was determined before CRT during intrinsic conduction and during active CRT (figs 1 and 2). Figure 1 (A) Short-axis view with circumferential strain display before resynchronisation therapy at end systole with non-homogeneous colour distribution owing to dyssynchronous contraction. (B) Circumferential strain tracings for one cardiac cycle obtained from the parasternal short-axis view. There are six tracings for the six evaluated segments within the circumference. The doted line displays the mean circumferential strain from the six segments. The segment with the latest peak strain and the temporal difference between the segment with the earliest and the latest peak systolic circumferential strain (ΔT pre) are marked. Figure 2 (A) Short-axis view with circumferential strain display during resynchronisation therapy at end systole with homogeneous colour distribution owing to more synchronous contraction. (B) Circumferential strain tracings for one cardiac cycle obtained from the six evaluated segments within the circumference. The tracing obtained before CRT from the segment with latest peak strain is added as a dashed green line. The tracing of this segment during resynchronisation therapy is marked with a white arrow. The reduction in contraction delay with resynchronisation therapy compared with before therapy for this segment is marked with a yellow arrow. It was greatest among all 36 LV segments of this patient, indicating the LV lead position. The temporal difference (ΔT post) between the segment with the earliest and the latest peak systolic circumferential strain is shorter than before resynchronisation therapy. The segment with the latest peak circumferential strain before CRT in relation to the QRS complex was determined (fig 1). This segment was defined as the optimal target segment for LV lead positioning. Echocardiograms before CRT during intrinsic conduction and during active CRT were compared to determine the segment with the maximal temporal difference in peak circumferential strain (ie, with the greatest reduction in contraction delay due to CRT). This segment was assumed to be the location of the LV lead (fig 2). The distance between the assumed LV lead position and the segment with maximal baseline dyssynchrony was counted in the number of segments referring to the six apico-basal levels and the six segments within one circumference. One distance step was related either to the apico-basal level or to the circumferential level. The optimal position of the LV lead was defined as concurrence of segments or immediate neighbouring of the segment with maximal dyssynchrony and the segment with the assumed location of the LV lead. The non-optimal position of the LV lead was defined as more than one distance step between these segments. On this basis 25 patients were classified as belonging to the optimal LV lead position group and 22 patients the non-optimal LV lead position group. Reading of all studies was repeated 8 weeks apart by the same reader on the same echocardiographic study to define intraobserver variability and by a second independent reader to define interobserver variability. Intraobserver and interobserver agreements on preoperative definition of the same LV segment as optimal LV lead pacing site were 95% and 93%, respectively. Intraobserver and interobserver agreement on definition of optimal or non-optimal LV lead pacing site was defined using κ statistics.13 The κ value was 0.95 for the intraobserver and 0.91 for the interobserver agreement. To verify the accuracy of the described echocardiographic technique for defining the LV lead position, CT was performed in 10 patients after CRT implantation. A 36-segment model similar to the echocardiographic model was applied on the left ventricle. There was high agreement between the anatomical location of the LV lead defined by CT and the assumed LV lead position defined by myocardial deformation imaging. The κ value was 0.81. Continuous data are expressed as mean (SD) values and compared using Student’s t test or analysis of variance as appropriate. Categorical data were presented as frequencies and compared using Pearson’s χ2 test. For comparison of parametric variables before and after CRT, a two-way analysis of covariance model was fitted using lead position as factor and baseline measurement as covariate. To maintain an overall significance level of 0.05, a Bonferroni adjustment was made for multiple comparisons, considering a p value of <0.01 as significant. Figure 3A shows the location of the segment with latest maximal systolic strain before CRT. There was no difference in the distribution of the location of latest contraction before CRT between patients found to have an optimal LV lead position and those found to have a non-optimal LV lead position. Figure 3 Distribution of segments with the latest peak systolic circumferential strain before resynchronisation therapy (A) and the assumed left ventricular lead position (B) considering the six short-axis views. In 25 patients the assumed position of the LV lead was in agreement or immediately neighbouring the location of the latest contraction before CRT. These were the patients with an “optimal lead position”. In 22 patients the assumed position of the LV lead was not in agreement or immediately neighbouring the location of the latest contraction before CRT. These were the patients with a “non-optimal lead position”. There was a mean (SD) distance of 3.1 (1.0) segments between the assumed LV lead position and the segment of maximal dyssynchrony before CRT. Figure 3B shows the location of the assumed LV lead position for all patients. Before CRT the maximal temporal difference between the segment with the earliest and latest peak systolic circumferential strain was 163 (35) ms in the group with optimal LV lead position and 160 (37) ms in the group with non-optimal LV lead position (p = NS). In addition to the segment with latest peak systolic strain, the segments with second and third latest peak systolic strain were determined. Seventy-eight per cent of segments with the second latest peak systolic circumferential strain and 63% of segments with the third latest peak systolic strain were within a two-step distance of the segment with latest peak systolic strain (the optimal segment for LV lead positioning). In the segment with second latest peak systolic strain the delay was 8 (3) ms less than in the segment with latest peak systolic strain (delay related to the earliest contracting segment 155 ms instead of 163 ms). In the segment with third latest peak systolic strain the delay was 14 (4) ms less than in the segment with latest peak systolic strain (149 ms instead of 163 ms). During active CRT the maximal temporal difference between segments with the earliest and latest contraction was significantly reduced in both groups (p<0.001): 109 (20) ms in the optimal LV lead group and 117 (27) ms in the non-optimal LV lead group. The reduction of the temporal difference between the earliest and latest contracting segment with CRT was 29% higher in the optimal LV lead position group than in the non-optimal lead position group (55 (16) ms vs 43 (15) ms, p = 0.051). The reduction in QRS duration during CRT was 44 (16) ms in the optimal and 34 (21) ms in the non-optimal LV lead position group (p = NS). There was a positive correlation between the change of temporal difference between the earliest and latest contracting segment and the change of QRS duration (r = 0.71), the change in Vo2max (r = 0.80) and the change in EF (r = 0.84). Six patients (five in the non-optimal LV position group and one in the optimal LV position group) were inadequate clinical responders to CRT. They demonstrated only minimal increase in EF and Vo2max. There was a significant improvement in LV function and exercise capacity in the total study group. The EF increased from 31 (6)% at baseline to 36 (7)% within 7 days after CRT implantation (p<0.001) and to 38 (7)% at 3 months’ follow-up (p<0.001). Similarly, GS as a measure of LV function increased from 11.9 (2.3)% at baseline to 14.2 (2.1)% within 7 days after CRT implantation (p<0.001) and to 14.9 (2.1)% at 3 months’ follow-up (p<0.001). Cardiopulmonary function testing demonstrated an increase in Vo2max from 14.1 (2.2) ml/min/kg at baseline to 15.7 (2.1) ml/min/kg at 3 months’ follow-up (p<0.001). Before CRT there were no differences in measured clinical characteristics, EF, and Vo2max between patients defined as having optimal or non-optimal LV lead position (table 1). After initiation of CRT, NYHA function class at 3 months was lower in the optimal LV lead group than in the non-optimal LV lead group and EF and GS at 7 days and 3 months’ follow-up were higher (table 2). Comparison of baseline results and results obtained at 7 days and at 3 months after CRT implantation demonstrated a greater increase in EF, GS and Vo2max for patients with optimal LV lead position than for the non-optimal LV lead position group (table 3). More detailed analysis of the impact of the distance between the segment with latest peak systolic strain before CRT to the segment with assumed LV lead position demonstrated a declining effectiveness of CRT with increasing distance. The improvement of EF and the increase of Vo2max declined with increasing distance of the assumed LV lead segment from the segment with the latest mechanical contraction before CRT (fig 4). Complete concordance of segments resulted in an improvement of EF by 12 (2)% at 3-months’ follow-up, whereas a distance of five segments between the assumed LV lead position and the segment with latest mechanical contraction before CRT was associated with no significant change in EF at follow-up. Figure 4 Improvement in (A) ejection fraction (EF) and (B) peak oxygen consumption (Vo2max) 3 months after initiation of resynchronisation therapy related to distance (counted in segments in the 36-segment model) from the segment with the latest peak systolic strain before CRT to the segment with the assumed LV lead position. This study presents to the best of our knowledge the first application of a new acoustic tissue tracking system based on two-dimensional echocardiographic images for analysis of circumferential myocardial strain in the setting of CRT. 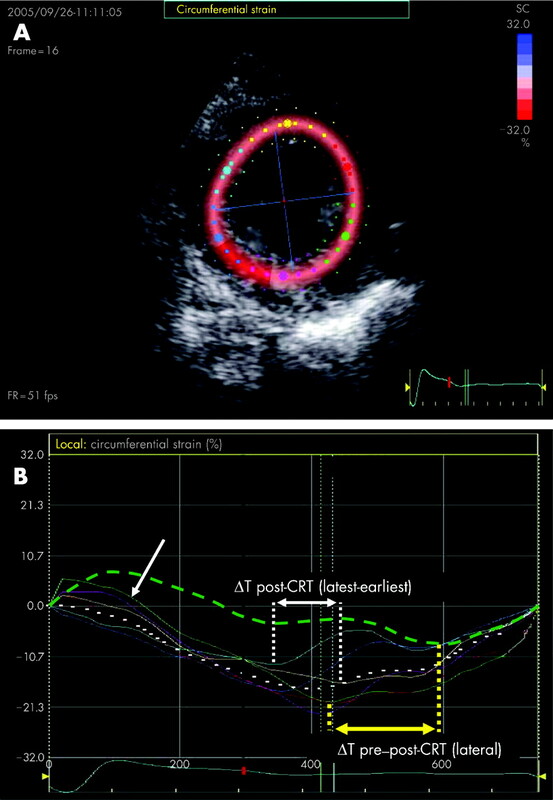 There are several important findings: (a) quantitative analysis of the temporal course of the LV contraction is possible by calculation of myocardial circumferential strain from frame-to-frame tracking of acoustic markers in two-dimensional echocardiographic images; (b) the system demonstrates improvement in myocardial contraction synchrony with CRT; (c) concordance or neighbourhood of the segment with the assumed LV lead position based on the greatest reduction in contraction delay and the segment with latest peak systolic strain before CRT results in significantly greater improvement in EF and cardiopulmonary capacity with CRT. Multiple echocardiographic modalities have been described for analysis of the temporal course of LV contraction.14–21 All these methods aimed at determining the degree of dyssynchrony in LV contraction. Thereby, the effectiveness of CRT on symptoms, functional capacity and LV reverse remodelling in patients with HF should be predicted. From these observational studies, the degree of LV dyssynchrony has been found to be a predictor of treatment response. Methods based on Doppler echocardiography have been applied in almost all studies to define the temporal course of LV contraction.15–17 19–21 However, echo-Doppler methods rely on longitudinal motion. Helm et al showed that the longitudinal motion analysis may be less sensitive to dyssynchrony because it follows different time courses than circumferential deformation and may therefore not adequately demonstrate CRT benefit depending on pacing mode.22 Thus, a non-invasive modality to analyse circumferential deformation rather than longitudinal deformation appears preferable in patients who may potentially receive CRT. The applied new two-dimensional echocardiography-based analysis modality allows determination of circumferential deformation measures from parasternal views and should therefore be optimal for analysis of cardiac asynchrony. This technique has become possible with the availability of ultrasound equipment, enabling high frame rate, high resolution imaging with low speckle noise.23 Analysis of the maximal temporal difference between segments with the earliest and latest peak strain before CRT and during CRT demonstrated a significant reduction with LV-based pacing, irrespective of optimal or non-optimal LV lead position. Although several studies have demonstrated the feasibility, safety and efficacy of CRT in the management of patients with advanced HF, the 30% of patients for whom the treatment is inadequate has been a matter of concern.3 4 6 10 Patient-related factors and technical factors are known to contribute to this failure rate. Several studies have tried to evaluate predictors of CRT success. In particular, Doppler echocardiographic studies have been used to define the degree of asynchrony before CRT as a predictor for CRT response. The focus of these studies has been the detection of patients with more LV asynchrony before CRT. The dependence of CRT success on technical factors, in particular the LV lead position, has been less extensively evaluated. Based on experimental electrophysiological studies, an LV lead position in the area of the latest contraction before CRT should result in the best resynchronisation effect.24 25 There is general agreement that placement should preferably be in the lateral to posterolateral position. Current approaches to finding an optimal LV lead position relate to an optimal immediate haemodynamic effect as well as a short QRS duration intraoperatively. However, these approaches are rather crude. Our study demonstrates that the agreement of an assumed LV position based on CRT-related changes in the contraction sequence with CRT and the segment with the latest contraction before CRT results in the best functional response. Furthermore, there was a significant relationship between the distance of the assumed LV lead position to the segment with the greatest need for pacing and the improvement in LV function. It has to be acknowledged that with the commonly used transvenous implantation techniques several technical factors have an important impact on LV lead placement and may prevent its optimal placement. Anatomical reasons such as the location of the cardiac veins often determine the actual placement of the LV lead.26 A distant anatomical run of the cardiac veins in relationship to the latest LV contraction, the impossibility of reaching a desired vein, insufficient anchoring of the LV lead in the desired place or scar formation not allowing sufficient electrical response in the desired lead position are the most common technical problems. Although epicardial lead implantation has been described as a viable alternative for a suboptimal transvenous LV lead position, a more meticulous search for an LV lead position within a cardiac vein which comes closer to the optimal pacing site is the desirable and less invasive procedure for optimising CRT success.27 28 Although there might be technical difficulties in reaching the optimal LV lead site, this study indicates that even a neighbourhood to the optimal LV lead site results in greater improvement of functional performance. Thus, every effort to obtain the most optimal LV lead position is warranted. 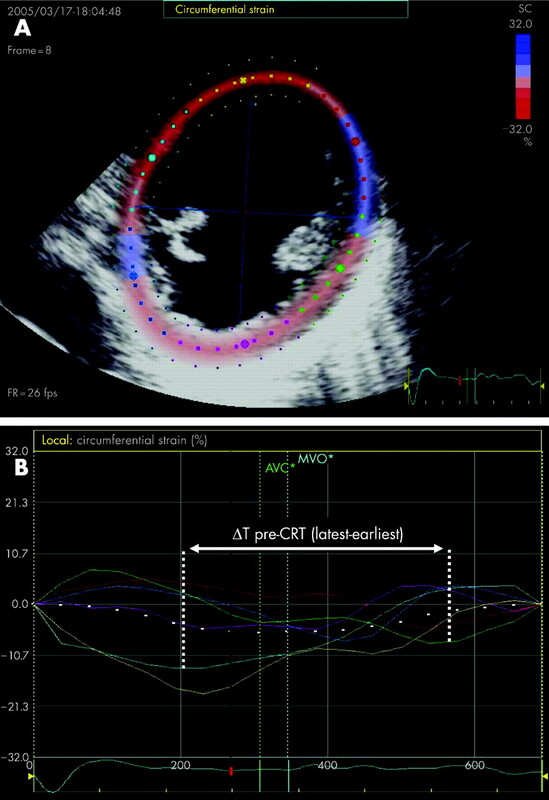 The described echocardiographic analysis comparing the segment with the latest systolic contraction before CRT with the segment demonstrating the greatest temporal change in contraction requires a considerable time with currently available techniques. However, semiautomatic analysis software may facilitate this approach in the future. This might allow application of the technique during LV lead implantation. The relationship between change in QRS duration and benefit of biventricular pacing has not yet been finally defined. Some studies demonstrated a relationship between the change in QRS duration and the benefit of biventricular pacing.29 30 In this study there was a non-significant trend for a greater change in QRS duration in the group with optimal LV lead position than in the non-optimal LV lead position group. Thus, while it is not finally clarified whether a great reduction of QRS duration is an electrical marker of optimal CRT pacing, concordance of the segment with greatest temporal reduction in time to peak strain with CRT and the segment with latest peak strain before CRT may serve as a mechanical marker for optimal CRT. Even patients with a non-optimal LV lead position showed an improvement of LV function and exercise capacity. This finding may be due to the multiple efforts undertaken at this centre to optimise the effect of CRT. In addition to a careful preoperative assessment, the intraoperative study of multiple lead placement sites with measurement of the QRS width and the evaluation of the change in blood pressure to optimise the effect of CRT are likely to have resulted in a relatively great benefit from CRT. Thus, even patients with a non-optimal LV lead position had an improvement with CRT. Six parasternal short-axis views were analysed one by one. A strain analysis based on three-dimensional data sets would be desirable, but is currently not available. Thus, equal distribution of segmentation throughout the left ventricle is not warranted using the current technique. Tracking of acoustic markers in two-dimensional echocardiographic images was not possible in all segments. Thus, the segment with the latest systolic contraction or the segment with the optimal LV lead position might have been missed in some patients. However, this should not have affected the principal findings of this study. Considering echocardiograms before and during CRT, the segment with the maximal temporal difference in peak circumferential strain was determined and assumed to be the anatomical location of the LV lead. This relates to the greatest reduction in contraction delay. This assumption has not been extensively evaluated. However, it is based on the known effects of CRT on LV contraction, and in 10 patients CT demonstrated high agreement between assumed and anatomical LV lead positions. We defined the optimal LV lead position as concordance or immediate neighbourhood of the segment with maximal temporal difference in peak circumferential strain from before CRT to during CRT to the segment with latest peak systolic strain before CRT. This definition is arbitrary and resulted in a high number of patients with a non-optimal lead position. A different definition of optimal lead position considering a greater distance of the lead segment from the segment with the latest contraction before CRT would have resulted in a greater number of patients with optimal lead position. The precise definition of the optimal LV lead position in relation to the segment with the latest contraction before CRT resulting in functional and clinical improvements should be determined in future studies. However, there was a continuous reduction in the improvement of EF with CRT with increasing distance between LV lead position and the segment with the latest contraction before CRT. Still, the concept of this study should be proved in a larger patient cohort. The aspect of viability was not investigated in this study. Therefore, the possibility of an inadequate response of the CRT system because of LV lead positioning at a non-viable segment cannot be excluded. Calculation of circumferential strain by tracking of acoustic markers in two-dimensional echocardiographic images can be used to describe the temporal course of LV contraction. Concordance or neighbourhood of the LV segment with the latest contraction before CRT and the LV segment with greatest difference in contraction sequence by CRT results in significantly better effectiveness of CRT on LV function. A well-directed placement of the LV lead at the optimal pacing site is desirable.
. Pacing Therapies in Congestive Heart Failure (PATH-CHF) Study Group. Long-term clinical effect of hemo-dynamically optimized cardiac resynchronization therapy in patients with heart failure and ventricular conduction delay. J Am Coll Cardiol 2002;39:2026–33.
. Long-term benefits of biventricular pacing in congestive heart failure: results from the multisite stimulation in cardiomyopathy (MUSTIC) study. J Am Coll Cardiol 2002;40:111–8.
. Multisite Stimulation in Cardiomyopathies (MUSTIC) Study Investigators. Effects of multisite biventricular pacing in patients with heart failure and intraventricular conduction delay. N Engl J Med 2001;344:873–80.
. MIRACLE Study Group Multicenter InSync Randomized Clinical Evaluation. Cardiac resynchronization in chronic heart failure. N Engl J Med 2002;346:1845–53.
. Multicenter InSync ICD Randomized Clinical Evaluation (MIRACLE ICD) Trial Investigators. Combined cardiac resynchronization and implantable cardioversion defibrillation in advanced chronic heart failure: the MIRACLE ICD Trial JAMA 2003;2892685–94.
. QRS duration and shortening to predict clinical response to cardiac resynchronization therapy in patients with end-stage heart failure. Pacing Clin Electrophysiol 2004;27:308–13.
. Echocardiographic evaluation of resynchonization therapy: ready for routine clinical use? A critical appraisal. J Am Coll Cardiol 2004;44:1–9.
. Ventricular asynchrony predicts a better outcome in patients with chronic heart failure receiving cardiac resynchronization therapy. J Am Coll Cardiol 2005;45:65–9.
. Clinical efficacy of cardiac resynchronization therapy using left ventricular pacing in heart failure patients stratified by severity of ventricular conduction delay. J Am Coll Cardiol 2003;42:2109–16.
. Two-dimensional strain—a novel software for real-time quantitative echocardiographic assessment of myocardial function. J Am Soc Echocardiogr 2004;17:1021–9.
. A coefficient of agreement for nominal scales. Educ Psychol Measurement 1960;20:37–46.
. Cardiac resynchronization therapy tailored by echocardiographic evaluation of ventricular asynchrony. J Am Coll Cardiol 2002;40:1615–22.
. Cardiac resynchronization therapy can reverse abnormal myocardial strain distribution in patients with heart failure and left bundle branch block. J Am Coll Cardiol 2003;42:486–94.
. Doppler myocardial imaging to evaluate the effectiveness of pacing sites in patients receiving biventricular pacing. J Am Coll Cardiol 2002;39:489–99.
. Tissue Doppler echocardiographic evidence of reverse remodeling and improved synchronicity by simultaneously delaying regional contraction after biventricular pacing therapy in heart failure. Circulation 2002;105:438–45.
. Real-time three-dimensional echocardiography. A novel technique to quantify global left ventricular mechanical dyssynchrony. Circulation 2005;112:992–1000.
. Left ventricular functional recovery during cardiac resynchronization therapy: predictive role of asynchrony measured by strain rate analysis. Pacing Clin Electrophysiol 2005;28(Suppl 1):1–4.
. Acute effects of cardiac resynchronization therapy on left ventricular Doppler indices in patients with congestive heart failure. Am Heart J 2002;143:34–44.
. Tissue Doppler imaging predicts improved systolic performance and reversed left ventricular remodeling during long-term resynchronization therapy. J Am Coll Cardiol 2002;40:723–30.
. Cardiac dysynchrony analysis using circumferential versus longitudinal strain: implications for assessing cardiac resynchronization. Circulation 2005;111:2760–7.
. 2D strain – new approach to strain and strain rate: the solution to the angle-dependence of tissue Doppler? [abstract]. Eur Heart J 2004;25:P2862.
. Characterization of left ventricular activation in patients with heart failure and left bundle-branch block. Circulation 2004;109:1133–9.
. The coronary venous anatomy. A segmental approach to aid cardiac resynchronization therapy. J Am Coll Cardiol 2005;46:68–74.
. Comparison of left ventricular lead placement via the coronary venous approach versus lateral thoracotomy in patients receiving cardiac resynchronization therapy. Am J Cardiol 2004;94:59–63.
. J Utility of echocardiographic tissue synchronization imaging to redirect left ventricular lead placement for improved cardiac resynchronization therapy. Pacing Clin Electrophysiol 2005;28:461–5.
. Evaluation of different ventricular pacing sites in patients with severe heart failure: results of an acute hemodynamic study. Circulation 1997;96:3273–7.
. Comparative effects of permanent biventricular and right-univentricular pacing in heart failure patients with chronic atrial fibrillation. Eur Heart J 2002;23:1780–7.
. Clinical and electrocardiographic predictors of a positive response to cardiac resynchronization therapy in advanced heart failure. Eur Heart J 2005;26:1094–100. Importance of concordance between left ventricular pacing sites and latest activated regions: myth or reality?